Welcome to the three hundred and twenty-first of my blog interviews with novelists, poets, short story authors, biographers, agents, publishers and more. Today’s is with historical novelist Cynthia Haggard. A list of interviewees (blogged and scheduled) can be found here. If you like what you read, please do go and investigate further. Morgen: Hello, Cynthia. Please tell us something about yourself, where you’re based, and how you came to be a writer. Cynthia: I’ve had four careers: violinist, cognitive scientist, medical writer and novelist. I was born and raised in the UK, but have been living in the US for 30 years. I currently live in Washington DC. I came to novel writing eight years ago, when I was taking a creative writing course to improve my prose style as I made the adjustment from being an academic to a medical writer. On the first day of the Intro to Novel class, the Stegner fellow who was teaching us asked for the first five pages of our new novel. I gulped, but ever the good student complied. That is how Thwarted Queen began in the Fall of 2004. Morgen: Oh wow. It’s funny how we fall into things. I got the bug when I went to a college’s creative writing workshop because I’d brushed up on my languages and computer skills. It was very much a case of “OK, what’s next?” and that’s been ‘it’ ever since. 🙂 What genre do you generally write and have you considered other genres? Cynthia: I write historical fiction, because I have this annoying tendency to float around in the past. I don’t think I could write any other kind of genre. Fortunately, historical fiction is a large umbrella, which includes romance, mystery, fantasy and thriller. Morgen: It does and it’s all very popular. What have you had published to-date? 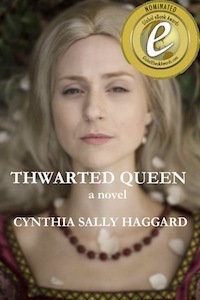 Cynthia: I published my first novel Thwarted Queen in October 2011 as an e-book. TQ is also available as a 4 e-volume set (The Bride Price, One Seed Sown, The Gilded Cage, Two Murders Reaped) and as a 3 volume paperback set (Rose of Raby, The Gilded Cage, Two Murders Reaped). All of these versions are available on Amazon. Cynthia: During 2010, I sent out the manuscript of TQ to 45 agents. Though I got some nibbles, ultimately it was rejected. Like everyone else, I don’t like have my work rejected. However, I also see it as an opportunity to learn. My problem with the agent system as it currently stands is that when agents pass on something – even if they’ve demanded an exclusive that lingers on for three months – they don’t feel obliged to give you feedback. In my book, that is worse than a waste of time. Subsequently, I went to a couple of writer’s conferences in the spring of 2011 (Unicorn and Maryland) and paid extra to talk one-on-one with professional agents and editors. Finally, I learned what I needed to know. Armed with this knowledge I sat down and worked on it until it was right. So my attitude to rejection is to try and use it as an opportunity to learn. Morgen: The trouble with sending work anywhere is that there is invariably one person doing two people’s jobs so even a tick-box reply is time-consuming with the amount of submissions they get, although I do think that’s the least they should do. Not replying at all is mean. I presume therefore that you don’t currently have an agent? Do you think they’re vital to an author’s success? Cynthia: No, not currently. I obtained an agent for a short time in 2010, and didn’t find her particularly helpful. Are agents vital to an author’s success? That depends on the agent and where the author is in their career. For an emerging writer like me, the most useful thing an agent could do (apart from getting good contracts) would be to help manage my career. Morgen: I certainly think when you get a good one that they do earn their keep. You mentioned Amazon earlier, are your books available as eBooks? Were you involved in that process at all? Do you read eBooks or is it paper all the way? Cynthia: My books are available as eBooks. I was heavily involved. I created the cover. I did the interior design. I uploaded it onto Amazon. I did hire a professional editor to copyedit the manuscript. And I hired a professional to transform my files into MOBI and Epub. My preference is to read fiction as an e-book, and non-fiction in paperback. This is because when I’m reading non-fiction, it is typically a “how-to” book and I need to flip back and forth. For fiction, I prefer e-format because it prevents me from cheating and reading the end! Morgen: 🙂 How much of the marketing do you? Cynthia: I do all the marketing, and have given myself the goal this year of becoming thoroughly acquainted with it. Morgen: It can be a slow process. You obvious had a lot of input into your books and you mentioned the covers, how important do you think they (and the titles) are? Cynthia: I think that titles and covers are tremendously important, and yes I had full control over their design. I used various French chateaux as backdrops, both because the culture of my protagonist Cecylee Neville was so heavily French-identified, and also because I wanted to give these books an almost fairy-tale like quality. After all, many of the illustrations for Fairy Tales show people dressed in the garb of the 1400s, when Cecylee was alive. Cynthia: I am working on another family saga called An Unsuitable Suitor. Set in 1920s Washington DC and Berlin Germany, it is a tale of identity, forbidden love and family secrets. I hope it will be published next year, 2013. Cynthia: I try very hard to write every day, and don’t always succeed. However, I have got into the habit of reserving my mornings for writing as it is my best time of day. Like everyone else, I suffer from writer’s block. But I don’t let it ruin my life. If I get stumped, I simply put the MSS down and work on something else. Then I return to it the next day, knowing that that wonderful machine we have in the brain called the mind, will be working away at it underground while I get on with other things. Morgen: That’s the trick – have some variety and your brain will keep fresh. Do you plot your stories or do you just get an idea and run with it? Cynthia: I do a bit of both. I get an idea and start out doing research. Then I just write for a while. When I’ve got to the part of the novel which I think of as the end of Act I, I stop and organize. That way I can have the best of both worlds: I can have the magic of writing on inspiration, without writing pages of stuff I don’t need. I very rarely write something I don’t re-use. Morgen: That’s a very good plan. My heart sinks when I hear / read of writers who have deleted x,000s of words because they didn’t think it worked. That’s what copy / paste or File / Save As is for. 🙂 Do you have a method for creating your characters, their names and what do you think makes them believable? Cynthia: Yes. I spend a lot of time getting to know them. This is why it takes me some time to write a novel, because I like to take the time and trouble to get to know my characters. I create documents for them, in which I interview them. After the interview, I write in a sort of free-form fashion trying to get their voice. Morgen: That sounds like fun. 🙂 I think the characters are the most important aspect of a book – however good a plot is if we don’t like the characters (the ones we’re supposed to like anyway), we’re bound to lose interest in what’s happening around them. Do you write any non-fiction, poetry or short stories? Cynthia: I’ve written a lot of non-fiction in my life as an academic and medical writer. I love writing poetry, and have even tried my hand at the occasional short story. Morgen: I love short stories. 🙂 Do you do a lot of editing or do you find that as time goes on your writing is more fully-formed? Cynthia: I always edit as I go along, working scene by scene. In the earlier drafts, I don’t worry much about copy-editing because I’m doing all the structural editing. By the fifth draft, I’m polishing the text. Morgen: I do about four or five drafts (usually no more than that). Do you have to do much research? Cynthia: As a historical novelist, I have to do a tremendous amount of research. Then I have to endure throwing most of it away so that the novel doesn’t read like a history book and bore the reader! Morgen: I read only today in a back-copy of a writing magazine where a top historical author was criticised for overusing his research. I guess it’s very tempting to impress but it often backfires. What point of view do you find most to your liking: first person or third person? Cynthia: In my experience, the material dictates POV. Generally speaking, I don’t care for first person present as I find it pallid and unemotional. There is one exception to this, when writing in the voice of a child. In my novels, I tend to write in close third, because I like to have more than one POV. In Thwarted Queen, this POV issue was quite a challenge because it is a very long novel, mostly about one person. In the end I split it into four books, using different POVs for each book. I wrote the first book of the novel, The Bride Price, in first person present, to capture the freshness of a nine-year-old girl. I wrote the second book, One Seed Sown in first person past, to convey the more mature voice of a young woman in her twenties. The third book, The Gilded Cage, is the story of Richard of York’s political career (Richard of York was Cecylee’s husband) and the opening salvos of the Wars of the Roses. To capture the complexity of the material, and the different voices used to tell it, I wrote that book in third person. The fourth book, Two Murders Reaped, is the story of the last 35 years of Cecylee’s life after the death of her husband, I wrote that in first person past. Cynthia: I love writing. And I don’t mind marketing or thinking like a business person. I guess this is because I’ve been running my own business for the past five years. It surprises me that I find it possible to go from being an artist to being a business person. Cynthia: Understand that this is an endeavor that takes a lot of work, and set about learning how to do it as systematically as you can. You don’t have to go for an expensive MFA to learn how to write. On the other hand, you do need to develop a community of people who will read your work. Feedback is the most precious commodity in a writer’s life, and it becomes in increasingly short supply as a writer becomes more advanced at writing. So even if you are a recluse like me, you still need to think about how you are going to find that valuable feedback that all writers need in order to grow and develop at their craft. The saddest thing is to see talented writers wither because they aren’t given enough time to write their novels and they aren’t given the feedback that they need. Morgen: I would definitely agree about feedback. I run two writing groups and belong to three others and I’m often alerted to things in my writing that had not occurred to me. Is there a word, phrase or quote you like? Cynthia: I love to dance, I’ll dance to anything. I love music, and play violin and piano. I walk a lot (I don’t have a car and live in the city). I enjoy hiking. And I go to my favorite yoga studio 3-4 times a week. Cynthia: For the craft of writing, I recommend James N. Frey’s books and a series of books on craft put out by Writer’s Digest. For marketing books, you can’t do any better than Dan Poynter’s volume. Cynthia: To find out more my novels, please visit http://spunstories.com. I had said everything I could. Was there any way of annulling this ridiculous marriage? Edward lifted his chin and stared at me. Born and raised in Surrey, England, CYNTHIA SALLY HAGGARD has lived in the United States for twenty-nine years. She has had four careers: violinist, cognitive scientist, medical writer and novelist. Yes, she is related to H. Rider Haggard, the author of SHE and KING SOLOMONS’S MINES. (H. Rider Haggard was a younger brother of the author’s great-grandfather.) Cynthia Sally Haggard is a member of the Historical Novel Society. You can visit her website at: http://spunstories.com.